Christmas tree foliage for sale. Blue-green in colour with a pine fragrance. 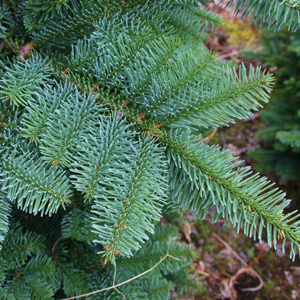 The Noble Fir foliage is blue/green in colour, has a festive pine fragrance and does not wilt easily. Hence, it is much sought-after by florists and wreath-makers who make wreaths and other Christmas decorations. 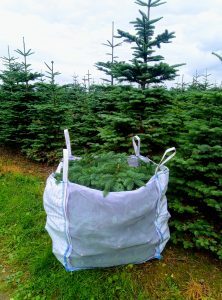 We sell premium Noble Fir foliage in either Large (cubic meter) bags or handy 10 Kg bags. Click here for prices and buying Christmas tree foliage on-line. Or you can contact Madeleine on 087-1333980. When you buy direct from Kellehers Christmas tree farm, you get the best quality and value because we can harvest fresh foliage daily as required. You can come and collect from our farm. Or we can deliver to Naas, Newbridge or West Dublin. For directions to Kellehers Christmas tree farm, click here.